At these special prices, all sales are considered final. All manufacturers' warranties are in full effect. All items listed here are new, we are just temporarily over stocked. 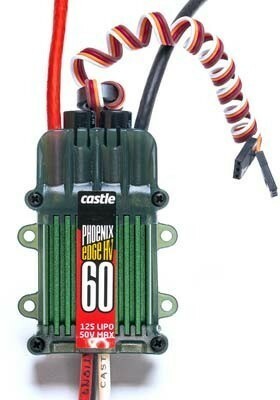 With the debut of the Phoenix Edge series of ESCs the next evolution in speed controller technology has arrived. 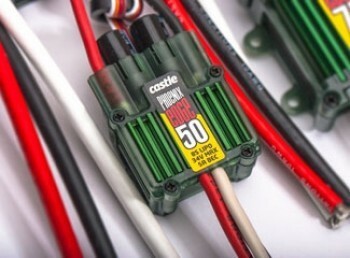 The Edge series introduces a user programmable auxiliary wire capable of functions modelers have only dreamed of, until now. 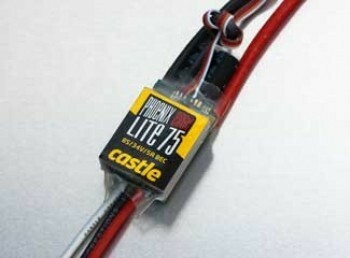 The white auxiliary wire can be used for helicopter governor gain input adjustments mid-flight, serve as an audible beacon after an "unexpected landing", act as an RPM output for 3-axis gyros that support RPM sensors, be used as an ESC arming lock (coupon for free Arming Lockout Key included) or as a receiver arming lock. Combined with the data logging capability the Edge series of controllers offer, users can enjoy unparalleled versatility. The Phoenix Edge series is intended for use in helicopters ranging from 450 to 800 size, and fixed wing aircraft up to 1.20 size and larger. 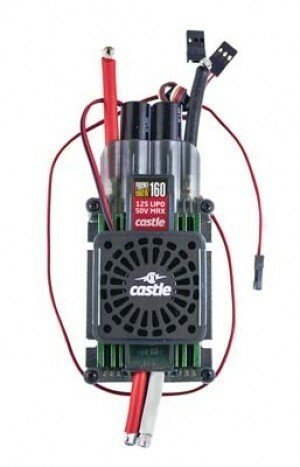 As always, the Edge series of controllers offer industry-leading software functions, data logging, and USB programming capability via Castle Link USB adapter (free with included coupon). 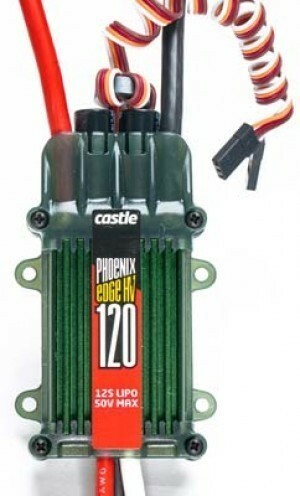 Max Input Voltage 3S to 12S Lipo, 9S A123, 22 cells Nicad or NiMH. 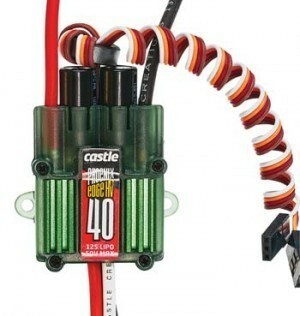 15 AMP control with BEC. . More versitile, capable of flying anything S-400 and below and will handle most 480 setups as well. 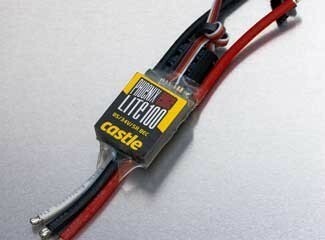 Note, this control is inexpensive and works well but is about 3x as big as a GFS 12 or Castle 20. 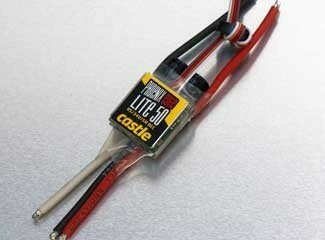 Weight 17g, Size 27.5x19.5x6mm.GWS Products warranty info. 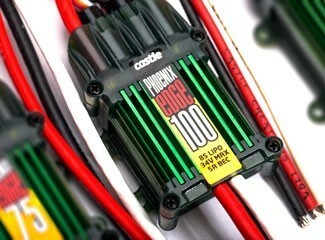 Max Input Voltage 2S to 8S Lipo, 9S A123, 22 cells Nicad or NiMH. BEC: Switch rate regulator, 5 amp max adjustable from 5 to 7v in .1v increments. 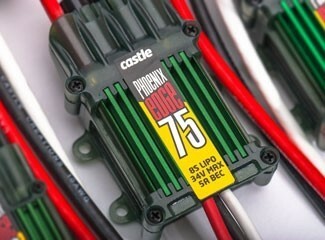 BEC: Switch rate regulator, 5 amp max adjustable from 5 to 8.4v in .1v increments.